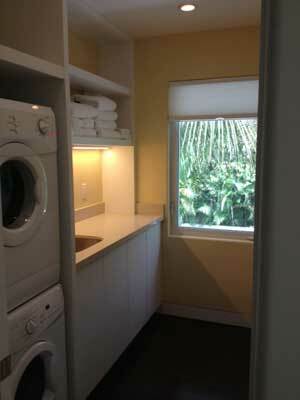 Kitchens, baths and just about every room of the house, including exteriors are targets for eco-friendly makeovers. 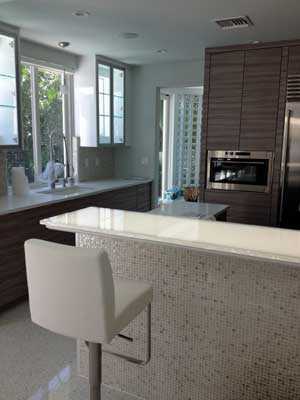 Many of the fine cabinetry manufacturers have made a concerted effort to include green products in their product lines. Implementation of these cleaner materials does not preclude or eliminate high style and up to the minute design. They work hand in hand with the crème de la crème of cabinetry companies and builders. In this beautiful kitchen of clean lines and contrasts, the chosen cabinetry is a horizontal pattern of heavy wood grain that appears richly weathered and casual, fully complementing the stainless steel appliances. 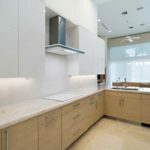 It is paired with gloss white upper cabinetry over the built-in range, and two glass-framed cabinets flanking the window and sink, creating airiness throughout. 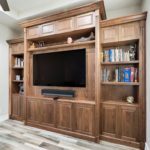 If you’re not familiar with what constitutes LEED materials, it is interesting to learn the composition of some of the components of the cabinetry. Northern Contours is the leading manufacturer of Thermofoil surfaces in North America. 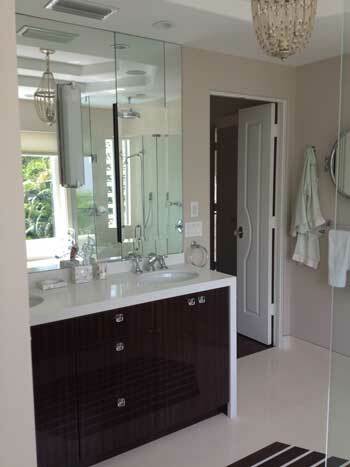 The door and drawer cores are comprised of one hundred percent recovered and recycled wood waste. 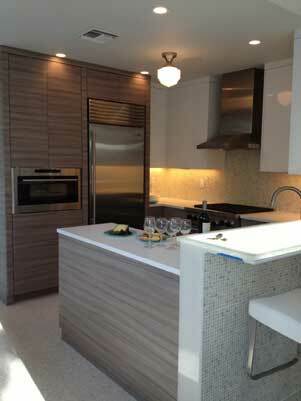 Schrapper’s team of highly specialized designers and cabinetry artisans used formaldehyde-free hardwood technology. This means no formaldehyde added at all. The adhesives are soy based and throughout the entire project, LEED and CARB2 compliancy was adhered to. Going green and organic does not mean forgoing design and style. 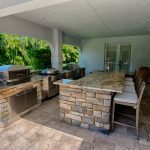 Beautifully crafted glass mosaic bar façade and back-splash, and solid glass bar top, are pleasing to the eye, as is the selection of minimalist light fixtures in a brushed stainless finish. 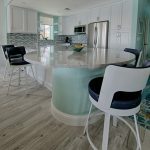 The designer chose to leave the windows untreated for additional airiness, and the uncluttered countertops and sleek barstools are well thought out moves to create a kitchen that is healthy, serene and timeless.